first trade edition, 7 X 8.5, 60 pgs., 1991. Six short stories with illustrations. #4 in the Wordcraft Speculative Writers Series. These stories have my immediate assent. They're pure as mountain spring water--a mountain whose ascent demonstrates how neatly Rich has built to scale. A pure prose style reflective of his poetry. 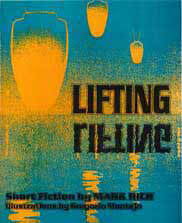 I found Mark Rich's Lifting thoroughly enjoyable. The stories are refreshing in their originality and have an endearingly laconic surreal quality which is equally effective in the light-hearted vein of "The Typewriter," and the more sombre mood of "Festival of the River." This is a very impressive debut collection, and I look forward to seeing more of the author's work in the future. Mark Rich has published fiction, poetry, reviews and essays in publications ranging from Manhattan Reivew, POem, Black Mountain Review and Small Press Review to Fantasy Review, Amazing Stories, Pandora, and Not One of Us. His critical work, much of it focusing on speculative poetry and science fiction, has appeared in this country and in France. His column, "Evolutionary Ethos" appears regularly in New Pathways. In 1984 he co-founded the Magazine of Speculative Poetry with co-editor Roger Dutcher, having earlier attempted small-press magazines similarly devoted to speculative poetry under the titles The Silent Planet (1972) and Treaders of Starlight (1974-76). Writing honors include awards from The Humanist magazine and Council for Wisconsin Writers. This is his first fiction collection. Gregorio Montejo has illustrated numerous books including Chronicles of the Rain Forest (science fiction poetry by Bruce Boston and Robert Frazier, Mark Ziesing Books; the Ocean View Double, Co-Orbital Moons, Robert Frazier/Prayer Wheels of Bluewater (Loss Pequeno Glazier, winner of the 1989 Readercon Award) and recently short stories by Brian Aldiss and Kim Stanley Robinsom. He lives in West Palm Beach, Florida.